The LORD comforts His people. Isaiah 40 is a beautiful chapter showing the care the LORD has for His people, even when they go astray. The photo below is just one of hundreds that I have made of shepherds with their sheep. Notice that there are two separate flocks and two shepherds. Shepherds tending their flocks at Socoh. Photo by Ferrell Jenkins. Socoh is identified with the tel on the left of the photo. It is located on the south side of the Elah valley. Socoh was a city of Judah where the Philistines gathered to fight with Saul and the men of Israel (1 Samuel 17). Shepherds frequently take the lambs in their arms. The Photo below was made near Heshbon in Jordan. A shepherd and a lamb. Photo by Ferrell Jenkins. 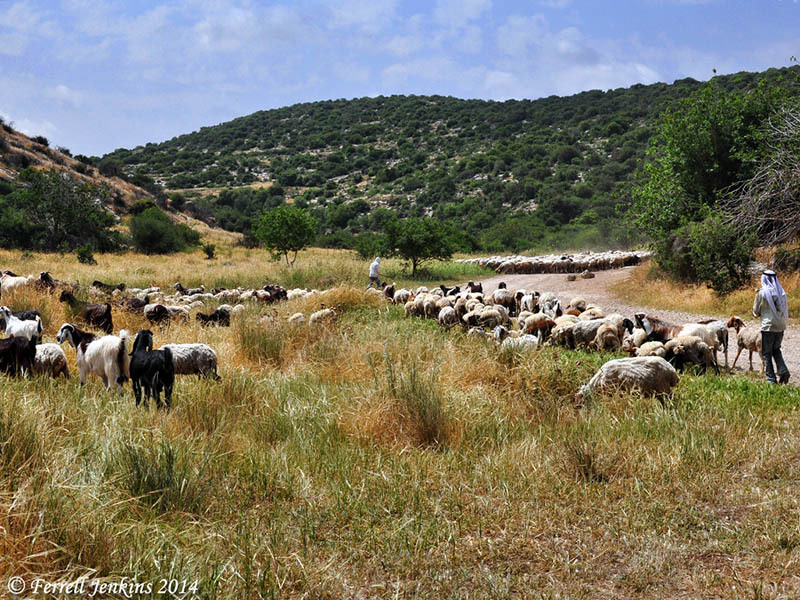 This entry was posted in Bible Lands, Bible Places, Bible Study, Culture, Jordan, Old Testament, Photography, Travel and tagged Isaiah, shepherd. Bookmark the permalink. These photos are looks very beautiful. Love these.